The 1997 International Time Project on comet Hale-Bopp was a great success and several major discoveries were made, including the first detection of a neutral gas tail, the observation of "cyanogen shells" and the detailed study of the rotation of the nucleus. Members of the Comet Hale-Bopp European Team participated in this project. This team was formed in early 1996 to co-ordinate European observing efforts because comet Hale-Bopp provided an extraordinary opportunity for scientists to observe a bright comet in great detail with the most advanced instrumentation, including the last generation of digital detectors. Observations carried out to study the distribution of sodium atoms in comet C/1995 O1 Hale-Bopp led to the discovery of a new type of comet tail. Sodium atoms had previously been seen near the center of other comets, but these observations revealed for the first time a straight tail of sodium 6 degrees long. The discovery images were taken with the CoCAM wide-field CCD camera, built and operated by staff at the Isaac Newton Group, set up next to the INT. CoCAM consists of a 35-mm camera zoom lens working at f/3.5 and imaging onto a 2220 × 1180 pixel EEV CCD chip, whose pixel size of 22.5m square corresponds to 26", thereby achieving on the sky a total field of 17° × 9°. 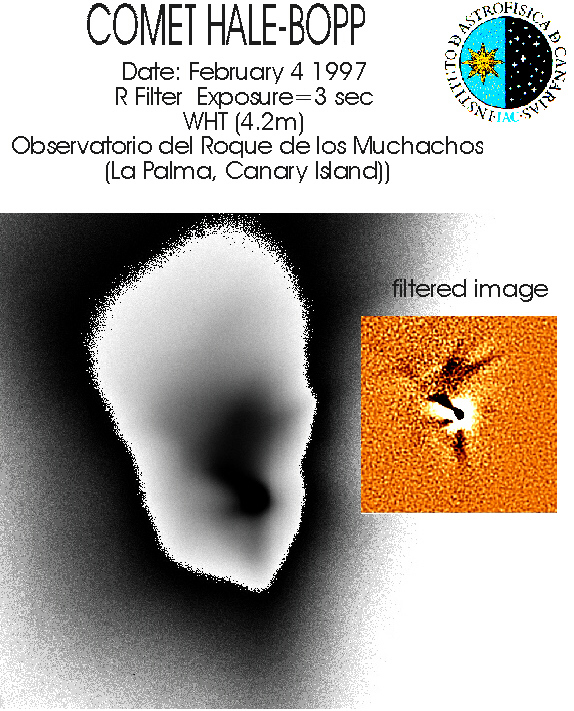 On 16 April members of the European Comet Hale-Bopp Team made several exposures of the comet through a narrow filter that isolates emission from sodium atoms, and to their great surprise they found that these atoms were distributed over an enormous region in and around the comet. Contrary to earlier observations of bright comets near the Sun, the sodium was present not only in the region next to the cometary nucleus, but there were also large amounts in the region of the cometary tails. Following a careful analysis of the observed distribution of these atoms, the astronomers concluded that comet Hale-Bopp displayed a third type of tail never seen before and consisting of sodium atoms. Whereas the well-known ion and dust tails so prominently displayed by Hale-Bopp show a large amount of structure, the new sodium tail had a completely different appearance. It takes the form of a long tail approximately 600,000 km wide and 50 million km long, in a direction close but slightly different to that of the ion tail. While the electrically charged particles in the ion tail are accelerated to large velocities by the solar wind (very fast atomic particles emitted by the Sun), the sodium atoms are released from dust grains and then accelerated in the antisolar direction by simple fluorescence. These latter conclusions were achieved thanks to observations with the William Herschel Telescope. Other interesting features reported by the European Comet Hale-Bopp Team include the spiral-jet and arc structures observed with the Jacobus Kapteyn Telescope in the inner coma of the comet. The astronomers made use of a CN and a blue continuum filter, obtaining an expansion velocity for CN of 1.3 km/s. 1.- Discovery image of the sodium tail in Comet Hale-Bopp taken on 16 April. The tail appears as a very straight narrow feature extending from the head of the comet to the upper left. (a) [ Small GIF | GIF | TIFF ] This spectrum corresponds to the sodium tail 3.1° from the nucleus, obtained with the WHT plus the Utrecht Echelle Spectrograph (UES) on April 23.9 UT. Sky lines due to OH and Na are labelled. The cometary NaD lines are clearly observable due to an apparent Doppler shift of 144 km/s from the terrestrial emission (Cremonese et al, 1997, Astrophys J, 490, L200). 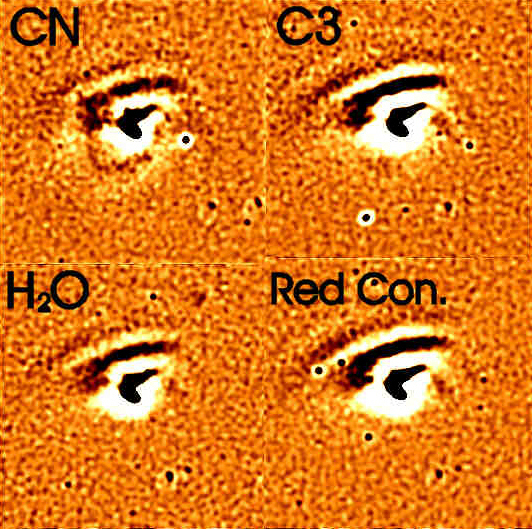 (b) [ GIF | BMP ] The picture on the right is an image of Comet Hale-Bopp showing the usual ion and dust tails of the comet, taken a few minutes before the discovery of the sodium tail. The dust tail is the broad tail pointing straight upwards, while the ion tail is the filamentary structure to the left. Comparison of the two images shows how the sodium tail has a completely different appearance to the other tails of the comet. G Cremonese et al, 1997, "Comet C/1995 O1 (Hale-Bopp)", IAU circular 6631. G Cremonese et al, 1997, "Comet C/1995 O1 (Hale-Bopp)", IAU circular 6634. G Cremonese et al, 1997, "Neutral Sodium from Comet Hale-Bopp: A Third Type of Tail", Astrophys J, 490, L199. 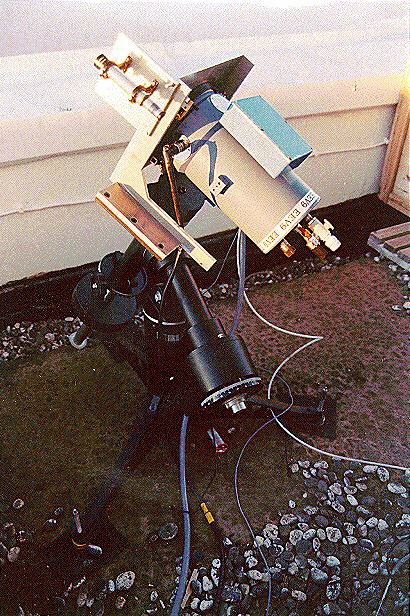 A Fitzsimmons, 1997, "Comet C/1995 O1 (Hale-Bopp)", IAU circular 6638. D Pollacco, 1997, "Comet Hale-Bopp: First Light on CoCAM", Spectrum Newsletter, 14, 12. For the first time, astronomers detected spiral structure in the disc of gas that surrounds one of the stars in an interacting binary star system. The observed system is known as IP Pegasi. IP Pegasi is an eclipsing dwarf nova, a subclass of cataclysmic variables, consisting of a K5 secondary star of 0.5 solar masses losing mass to a white dwarf of 1.0 solar masses in a 3.8-hour orbit. At semi-regular intervals of about three months the system brightens by 2 magnitudes as the mass transfer through the accretion disc suddenly increases. The disc is smaller than the radius of the Sun, so it is not possible to resolve it directly in any telescope. The technique used involved measuring the velocity of the gas by looking at the Doppler shift in its spectrum. As the stars revolve around each other in their 3.8-hour orbit, the observers got successively different views of the disc. By using a technique called "tomography", they were able to reconstruct a picture of the flow pattern of the gas. The results showed a two-armed trailing spiral in the outer part of the disc. Such spirals are thought to be created by tidal forces due to the gravitational pull of the normal star. The formation of such spirals had been predicted, but this is the first positive detection. This discovery was made thanks to observations carried out at the INT using Service time. The Service programme at the ING telescopes is well suited for undertaking a quick look at new cataclysmic variables or providing complementary emission-line information on old ones. But the programme's main advantage is that it offers the observers the opportunity of some flexibility over the predetermined schedule to cover unexpected events such as nova outbursts. Indeed the astronomers observed IP Pegasi while it was on the rise to outburst with the Intermediate Dispersion Spectrograph (IDS) on the INT, which resulted in the discovery of spiral structure in the binary's accretion disc. A hot disk of gas surrounding a compact white dwarf star in the constellation of Pegasus has recently been revealed to be imprinted with this dramatic pattern. The white dwarf is part of the interacting binary star system IP Pegasi and the disk of gas is an accretion disk formed of material lost from a companion star and falling toward the white dwarf. The disk itself is smaller than the Sun's diameter, so the spiral pattern can not be imaged directly by telescopes. Instead, the spiralling disk of gas is mapped over a series of observations using a spectroscopic technique known as Doppler "tomography". The left panel above shows a tomogram, the directly measured gas velocity map for the system. The relative brightness corresponds to the intensity of light emitted by Hydrogen gas moving at the indicated velocity. The position at the center of this panel represents the velocity of the binary system's center of mass. In the middle panel, a simple model velocity field consistent with the measurements is shown. At the right, the calculated position map of the IP Pegasi accretion disk reveals a striking two armed trailing spiral pattern [ JPG | BMP ]. E T Harlaftis and D Steeghs, 1997, "Spiral Waves in a Solar-size Accretion Disc", Spectrum Newsletter, 13, 4. 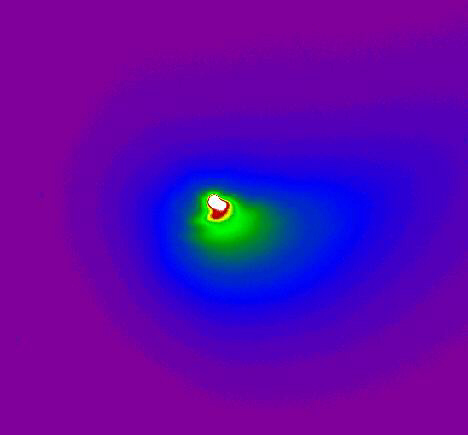 D Steeghs et al, 1997, "Spiral structure in the accretion disc of the binary IP Pegasi", MNRAS, 290, L28. Since the discovery of the first brown dwarf in 1995 by the WHT, it has been proved that objects with masses between those of stars and planets can be formed in nature and several observations of brown dwarfs have been reported. To directly detect single brown dwarfs of known age, distance and metallicity, the ideal place to search is within young open clusters. Many brown dwarf surveys have been conducted in the Pleiades open cluster. This is because the Pleiades cluster is near enough that the lower main sequence is not beyond the limits of detection, but far enough away that the area of sky covered is not too large. The cluster is young enough so that any brown dwarfs will be relatively bright. The discovery of the first brown dwarfs in a small survey of the Pleiades suggests that a large number of very low mass objects may populate this cluster. With the aim of searching for new Pleiades brown dwarfs, a deep ITP CCD I,Z survey was performed covering 1 deg2 within the central region of the cluster. Over 50 faint (I =>17.5), very red (I–Z => 0.5) objects were detected down to I~22. Their location in the I–Z color diagram suggested cluster membership. According to current evolutionary models, they should have masses in the interval 30 – 80 MJup (1 MJup ~ 10–3 solar masses). The most secure Pleiades brown dwarfs are those with kinematic information that supports cluster membership and lithium detection that confirm their substellar status. After spectroscopic observations, several candidates were confirmed as brown dwarfs, among them, Roque 4 (45 MJup, I=19.75, M9 V) and Roque 25 (35 MJup, I=21.17, early L), the coolest and faintest brown dwarfs ever observed. Roque 25 is a benchmark brown dwarf in the Pleiades because it is the first known one that belongs to the L-type class. The optical spectrum of Roque 25 is characterised by the following features: (1) the lack of strong molecular absorption band heads in the range 640–760 nm, in particular, the strong TiO bands starting at 705.0 nm are absent or extremely weak in Roque 25; (2) the molecular systems of CaH, CrH, and FeH become as strong or stronger than the systems of TiO and VO; (3) the atomic lines of KI and CsI that are very strong in L-type objects are weaker in Roque 25. Roque 25 provides evidence that the initial mass function extends down to about 0.035 solar masses and serves as a guide for future deep searches for even less massive young brown dwarfs. M R Cossburn et al, 1997, "Discovery of the lowest mass brown dwarf in the Pleiades", MNRAS, 288, L23. 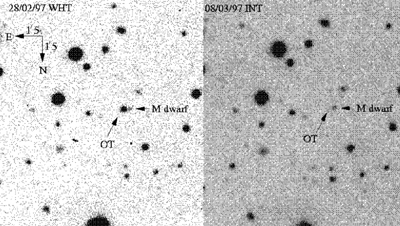 E L Martín et al, 1998, "The First L-Type Brown Dwarf in the Pleiades", Astrophys J, 507, L41. D J Pinfield et al, 1997, "Brown dwarf candidates in Praesepe", MNRAS, 287, 180. M R Zapatero Osorio, R Rebolo, and E L Martín, 1997, "Brown Dwarfs in the Pleiades cluster: a CCD-based R, I survey", Astron Astrophys, 317, 164. M R Zapatero Osorio, E L Martín, and R Rebolo, 1997, "Brown Dwarfs in the Pleiades cluster. II. J, H and K photometry", Astron Astrophys, 323, 105. M R Zapatero Osorio et al, 1997, "New Brown Dwarfs in the Pleiades Cluster", Astrophys J, 491, L81. It has been known since the 80's that hidden behind the apparent simplicity and uniformity of elliptical galaxies are some unusual properties. Almost half of the ellipticals which have been studied show faint luminous arcs which are called shells. The nucleus of between 20 and 30% of ellipticals rotate in the opposite or orthogonal direction from the rest of the galaxy. An undetermined number of ellipticals have rings or polar disks with stars, gas and dust. The existence of such structure can only be understood as a result of accretion or fusion processes between existing galaxies and not as a result of monolithic collapse during the formation stage. In fact the presence of two counter posed tidal tails is unequivocal evidence for the fusion of two disk galaxies. The fact that the tails are diluted with time until they become unobservable has made it difficult in the past to obtain fundamental proof of the origin of ellipticals from the fusion of spiral galaxies. This proof has been obtained as a result of observations with the INT of the peculiar elliptical galaxy NGC 3656. This galaxy had been understood to be the result of a minor fusion (an elliptical galaxy swallowing a smaller galaxy) due to the presence of photometric shells and a nucleus which rotates orthogonally. The INT data, after being treated with a special equalising process for the detector's photometric response, have revealed an extensive luminous halo and two tidal tails. Such tails are incompatible with minor fusion and suggest that a major fusion has taken place between two galaxies with disks of similar size in direct orbit. M Balcells, 1997, "Two tails in NGC 3656 and the major merger origin of shell and minor-axis dust lane elliptical galaxies", Astrophys J, 486, L87. NGC 1068 is a nearby (~ 22.7 Mpc), luminous and well-studied active galaxy. Despite of being the Seyfert 2 prototype galaxy, it shows broad permitted lines in polarised light. The current interpretation of this result is that NGC 1068 has a Seyfert 1 nucleus obscured from our direct view. The existence of a large concentration of molecular gas and dust in the nucleus of NGC 1068 supports this hypothesis. The kinematic off-centering between the inner and the outer regions of NGC 1068 observed in the gas velocity fields could indicate the presence of a non-symmetric contribution to the gravitational potential. Both regions exhibit kinematic minor axes aligned and could have similar systemic velocities. However, their kinematic centers are displaced by ~ 2.5", and this can be interpreted as two kinematically different stellar systems rotating around parallel but with shifted axes. The almost discontinuous transition between the inner and outer regions rather suggests a strong decoupling between both zones, as if they corresponded to two distinct stellar systems. This leads to the interesting possibility of considering NGC 1068 as a merger remnant: a satellite galaxy could have been captured by the primary galaxy, a merged core being situated close to the disk center of the primary. B García-Lorenzo et al, 1997, "Evidence of two kinematically different stellar systems in NGC 1068", Astrophys J, 483, L99. Since their discovery Gamma-Ray Bursts (GRBs) have been one of astronomy's great mysteries. The distribution and properties of the bursts are explained naturally if they lie at cosmological distances, but there is an opposing view that they are relatively local objects, perhaps distributed in a very large halo around our Galaxy. For a long time it was expected that the detection of a counterpart at other wavelengths would provide the key to understanding the GRB phenomenon. However, such counterparts were not found, in spite of much effort during the last 25 years. The main problem was the lack of fast and accurate GRB positions. With the launch of the Wide Field Cameras (WFCs) on board the Italian-Dutch X-ray satellite BeppoSAX this has changed. For the first time GRB positions can be determined with accuracies of a few arcminutes within a few hours after the burst, unprecedented in GRB astronomy. Finally the situation changed dramatically on February 28, 1997 when a team of astronomers led by Jan van Paradijs of the University of Amsterdam and the University of Alabama in Huntsville pointed the William Herschel Telescope to the part of the sky where shortly before a new GRB had been detected (GRB 970228) by the Gamma-Ray Burst Monitor onboard BeppoSAX satellite. On February 28, UT 23 h 48 m, 20.8 hours after the GRB occurred, the astronomers obtained a V-band and an I-band image (exposure times 300 s each) of the WFC error box with the Prime Focus camera of the William Herschel Telescope. The 1024 × 1024 pixel CCD frames cover a 7.2' × 7.2' field, well matched to the size of the GRB error box. The limiting magnitudes of the images were V=23.7, and I=21.4. They obtained a second I-band image on March 8, UT 21 h 12 m with the same instrument on the WHT (exposure time 900 s), and a second V-band image on March 8, UT 20 h 42 m with the Isaac Newton Telescope (exposure time 2500 s). A comparison of the two image pairs immediately revealed one object with a large brightness variation: it was clearly detected in both the V- and I-band images taken on 28 February, but not in the second pair of images taken on 8 March. The position of this object was coincident with all the known error-boxes of GRB 970228. This led the discovery team to conclude that they had identified the first example of optical afterglow of a GRB. Following this first detection, other optical counterparts of GRBs have been discovered and followed up photometrically and spectroscopically. In most of these subsequent detections the ING telescopes have played an important role. T Galama et al, 1997, "The decay of optical emission from the gamma-ray burst GRB 970228", Nature, 387, 479. T Galama et al, 1997, "Radio and optical follow-up observations and improved interplanetary network position of GRB 970111", Astrophys J, 486, L5. P J Groot and T J Galama, 1997, "Optical Afterglow of a Gamma-Ray Burst: GRB970228", Spectrum Newsletter, 14, 8. 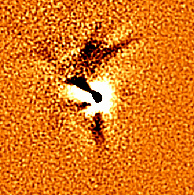 P J Groot et al, 1997, "GRB 970228", IAU circular 6584. J van Paradijs et al, 1997, "Transient optical emission from the error box of the gamma-ray burst of 28 February 1997", Nature, 386, 686. During an imaging survey of the evolution of the space density of radio-loud quasars, a quasar at z=4.72 was discovered. This quasar, GB 1428+4217, is the third most distant quasar and the highest redshift radio and X-ray source currently known. It has a radio flux density at 5 GHz of 259 ± 31 mJy and an optical magnitude of R ~ 20.9. The rest frame absolute UV magnitude is M (1450 Å) = –26.7. Another radio-loud quasar was discovered during the same CCD imaging survey, GB 1713+2148, with z = 4.01. Combined with earlier survey results, these objects give a lower limit on the space density of quasars with radio power P5 GHz > 5.8 × 1026 W Hz–1 sr–1 between z = 4 and z = 5 of 1.4 ± 0.9 × 10–10 Mpc–3. A C Fabian et al, 1997, "The extreme X-ray luminosity of the z=4.72 radio-loud quasar GB 1428+4217", MNRAS, 291, L5. I M Hook and R G McMahon, 1998, "Discovery of radio-loud quasars with z=4.72 and z=4.01", MNRAS, 294, L7. A new slitless spectroscopy technique was developed to simultaneously detect and measure the kinematics of planetary nebulae in external galaxies, and first experiments with ISIS spectrograph on the WHT proved successful. Plans now exists to build a dedicated instrument. Construction would take place in Groningen and at ASTRON. An international team led by astronomers of the University of Wyoming announced the discovery of a new type of star. In many binary systems, the initially more massive star ends its life and becomes a white dwarf, while the initially less massive star tries to evolve normally, but all the while loses mass to the white dwarf. Eventually, all that remains of the less massive star is an exposed stellar core with a size near that of the planet Jupiter and a mass of only 5/100th or so of its original value. Having used up or lost essentially all its hydrogen, this very small star has no remaining energy generation. It cannot ever become one of the usual stellar end-products. Therefore, it has a structure unlike any other kind of known star. This discovery was made thanks to observations with the WHT.